Irrigation maintenance is crucial for anyone who wants to maintain a beautiful and comfortable outdoor space. 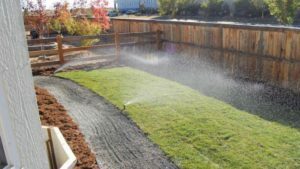 Without the right watering systems in place – and a plan for keeping them operating smoothly – you’re never going to have the green, luscious yard you’re dreaming of. Due to the unique climate we have in our area of Massachusetts, North Shore lawn irrigation takes a specialized expertise. It’s not as simple as putting a few sprinklers into place and hoping your lawn will spring up. Today we want to offer a quick guide to watering systems and irrigation maintenance for any homeowner in the area to review. Not only is it crucial to choose the right equipment for the job, but a good system is designed for the property where it will operate. That ensures proper coverage for all areas and greenery, and prevents waste and pools of standing water. Why install an expensive irrigation system, or create problems with mosquitoes and other pests? To get irrigation correct, you need a team that can evaluate your property, help you design a system that will serve your needs, and then keep it running smoothly one season after the next. Another common misconception is that irrigation systems in the North Shore can be set up and then forgotten about. That would certainly be more convenient than making ongoing adjustments is, but it’s not necessarily feasible. The climate in Massachusetts can vary a great deal from spring to summer and autumn. That makes it important to change not only the amount of water that is being put onto your lawn, but also the timing of your sprinkler system. Additionally, mid-season checkups and adjustments prevent small issues from becoming big problems. If you have lines that are clogged, sprinkler heads that are malfunctioning, or other issues that stop your property from being properly irrigated, it’s better to catch them sooner rather than later. Winterizing your watering system is a crucial part of your irrigation maintenance. Otherwise, lines can freeze, parts can be damaged, and you may find that your well-designed watering set up stops functioning the way it was supposed to. A good Massachusetts landscaping company will recognize this and factor ongoing maintenance into their irrigation planning. Don’t agree to work with any company that doesn’t have the skills, reputation, or forethought help you protect your property and your investment. When considering North Shore lawn irrigation, companies may state they can install the system you need. But, making a bad decision today could come back to haunt you later. That’s because the wrong watering setup might not give you adequate coverage, and if it isn’t designed or maintained properly, you could find yourself replacing components much earlier than expected. Why not turn to the Massachusetts experts in irrigation maintenance? Call Stefano’s today, at 978-352-8834 to talk about your property or schedule and at-home visit and assessment.